I will never forget the afternoon of January 31, 2011, when I was at my local health provider and received the devastating news that I had stage 4 throat cancer at the base of my tongue that had spread to my lymph nodes. My local health care provider gave me all the bad news, with odds of no better than 50 percent of the cancer never coming back after three years. The only treatment would be chemotherapy and radiation with a feeding tube being mandatory. After this diagnosis, I called my sister to explain what the doctors found. She insisted that I make an appointment at Mayo Clinic. I took her advice and made an appointment. This was the best decision of my whole life, and I would like to thank my sister and God for guiding me in this direction. Also, I would like to thank Mayo for their professionalism, expertise, direction, dedication and care like no other I have ever had by a health care provider. I am truly thankful for the whole staff – nurses, doctors, financial personnel and all the other Mayo personnel that I dealt with. Mayo is definitely world class like no other. After meeting with Dr. Eric Moore, head and neck surgeon at Mayo Clinic, and learning about other treatment options, my odds would increase to 80 to 90 percent by having transoral robotic surgery along with radiation and a 30 percent chance of chemo. This gave me no choice but to have the surgery at Mayo, even if it meant I had to come up with the money to pay for the surgery. Dr. Moore went above and beyond what most people would ever expect from a doctor. He spent a considerable amount of his own time explaining the case to my insurance provider to have the cost of the surgery covered. He managed to get this done within a couple of days, which I can’t thank him enough, because I know how busy he is. He is definitely dedicated to his patients no matter how much of his own time it takes. On February 14, 2011, Valentines Day; I underwent robotic surgery to remove the cancer and twenty-nine lymph nodes out of my neck. The first thing I did after I came out of surgery was check the movement of my right arm, which was the side the lymph nodes were taken out. I knew there were a lot of nerves that affected my shoulder and arm movement that would be involved during the surgery. I was extremely excited with all the movement I had and that I could lift my arm above my head without any problem. I did not expect such a fantastic outcome with the movement. The reason I was so excited was that I have had a passion for softball my whole life and play for a team out of Chicago in the 60 and older division in Senior Softball. We travel all over the country for 7 to 10 tournaments a year. This is a big part of my life and I did not want to have to give this up, even for this year. I knew at this point I would be playing ball this year. Two weeks after surgery I started lifting weights, and I was pleasantly surprised how well I could do the weight lifting. This also has been a big part of my life and I was able to lift what I did before the surgery. I actually went out in the yard with a couple of softballs to see if I could throw them with my right arm, and again, I was surprised how well I could throw without any pain. My next step was to seek the treatment of radiation and/or chemo, so I decided to contact Mayo and make an appointment to see their treatment plan. They told me about a clinical study that involved my type of cancer and asked if I would be interested in it. I decided this was something I wanted to do. They did wonders to fit me into ten appointments during this day to get ready for the clinical study. I appreciate Mayo for how they accommodated me by working hard to fit me into all these appointments. When I returned home, I found out my insurance rejected the treatment because they had the same clinical study at a nearby hospital. I decided to try this hospital but was struggling to find the doctors I needed. This is when Brad Schwarck from Mayo in Patient Financial Service called to see how things were going with the transition to the new hospital. I told him how frustrated I was trying to make the transition. Brad went way beyond what I would have ever expected. He spent the next hour and a half connecting with people at the hospital, with me on the line, making sure everything was arranged for me to begin this treatment as soon as possible. When Brad stepped in and spent considerable time making this transition very easy, he went way beyond any of my expectations, especially when I was leaving their organization and going to another. Thanks to Brad, I had an appointment the next day and started my radiation treatments about a week later. No wonder Mayo is world class like no other. During my radiation treatments my next question was how well I would be able to hit the ball. So after talking to my old senior softball team in Madison, they invited me to practice with them on April 16, 2011. Again, I was surprised how well I was hitting the ball without any pain after two months of recovery. I practiced with them for two weekends and kept hitting the ball better and better. I was actually hitting the ball over the home run fence and knew I would have the power hitting this year that I was always known for. I want again to thank everyone at Mayo for all their expertise and everything they did for me, which includes everyone I had contact with while at Mayo. I especially want to thank Dr. Moore, Dr. Robert Foote and all their staff, along with Brad Schwarck in financial for their exceptional help. But most of all, I want to thank Dr. Moore and his staff for the tremendous results I got after the surgery. 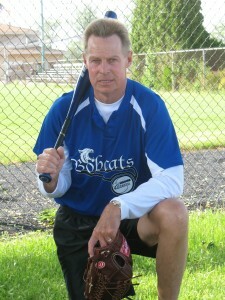 I’m still living my passion for softball and this year I was able to play in several tournaments with The Chicago Classics Bobcats, a 60 and older division of Senior Softball. Thanks again for keeping a passion of mine alive and increasing my odds for survival, you are world class like no other!! !